Live from Syracuse, it's PAWS of CNY! On Tuesday, January 4, PAWS of CNY volunteers Anna Mayerhofer and her Dachshund, Lumpi, Martina St. Leger and her Labrador Mix, Dory, and Jessica Marabella and her Chocolate Labrador, Blue, had an opportunity to appear live on CNY Central with Brandon Roth. PAWS of CNY had the pleasure of attending a teen New Year’s Eve celebration at Believer’s Chapel in Cicero on Thursday, December 31. The event offered teens fun and safe New Year’s activities, which included pet therapy provided by volunteers from PAWS of CNY. Volunteers from PAWS of CNY recently had an opportunity to provide pet therapy services to students residing at Watson Hall on the Syracuse University campus. 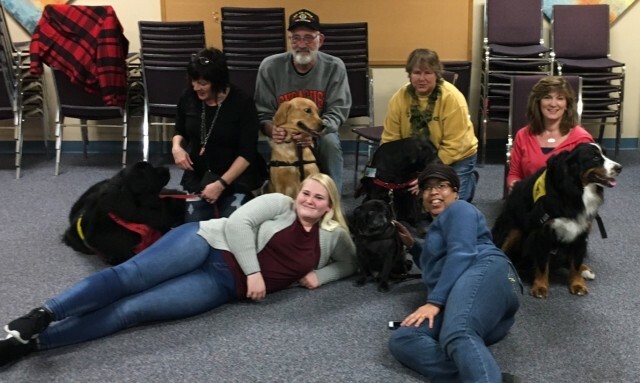 The event was organized to encourage students to take a much needed break from the stress and strain of mid-year exams and enjoy some warm interaction with PAWS of CNY’s therapy dogs. On Sunday, December 13, volunteers from PAWS of CNY had an opportunity to bring their certified therapy dogs to a student de-stress event at Syracuse University’s Haven Residence Hall. 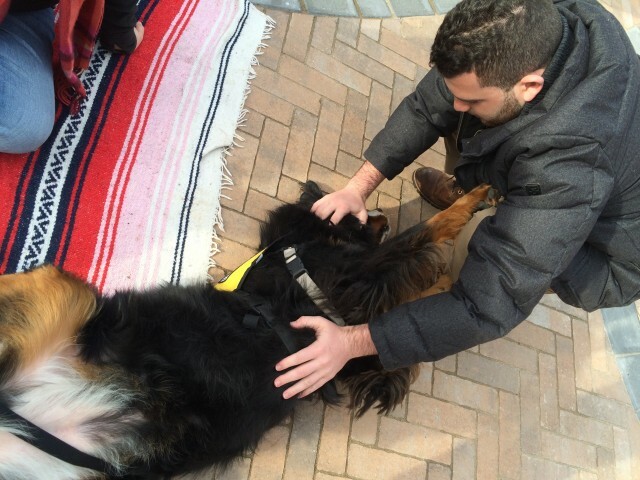 The event was scheduled to give students an opportunity to take a much needed break during the stress of finals week and enjoy the many benefits of pet therapy. On Monday, December 7, Students at Syracuse University celebrated the success of the launch of the What the Health Magazine – a student run publication focusing on fitness, nutrition and wellness for Syracuse University students. To help them celebrate and de-stess after months of hard work, the students invited representatives from PAWS of CNY for some much needed pet therapy.